Hi, I’m Chris Marshall with Woodworkers Journal magazine here at AWFS, in Wagner Electronics booth. 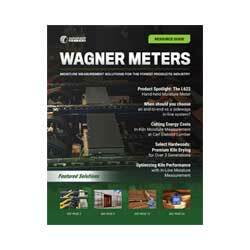 And Wagner really specializes in moisture meters, and as you probably know verifying your lumber is important to making sure that once you’re processing it for a piece of furniture, that you’re getting a moisture content that would give you the finished surface lumber you really need, usually between six and nine percent. Well, Wagner is making that easier than ever with a range of different moisture meters that use electromagnetic wave technology as opposed to pins, to give you a good, general reading of your lumber that you want to test. This happens to be their MMC220 model. Again, electromagnetic waves measure the amount of moisture in the piece of lumber and give you a good average measurement. It couldn’t be easier to use. Essentially, you turn on the unit, you dial in the specific species that you have in mind, the lumber that you’re measuring, and it comes with a booklet that gives you upwards to two hundred different specific gravities for various lumber species. Once you select the species that you have in mind, I’ve got a sample here, this is some oak. It has a specific gravity of 63 – so we dial that into the meter, hit our ON button, and simply drag it across the board that we have in question and you get a good general estimate of the moisture content of that piece of lumber. This happens to be seven point eight percent moisture content. So, as opposed to a pin-style meter that only gives you a specific point of measurement, Wagner enables you to get a good general overall estimate at any point in the board that you drag that meter.